After an eight-hour dance in microgravity, Dextre and the Canadarm became the first self-repairing robotic system in space, replacing a faulty camera without leaving orbit or relying on pesky astronauts. The Canadarm, Dextre, and mobile base stations work together as a robotic system attached to the International Space Station. Dextre, the arm's independent robotic hand, was plucked and plopped into position by the Canadarm to delicately replace a faulty video camera on the arm's elbow. One of the cameras at the arm's elbow-joint has been producing fuzzy images. It's still functional, just not ideal. So in an eight-hour space-dance, Dextre swapped it over to a less-critical location at the mobile base. Tuesday, he will retrieve a new camera from the airlock, and install it as a replacement on the arm's elbow. Dextre will start by retrieving a faulty camera located near Canadarm2's elbow joint. Since the camera is functional, but produces hazy images, Dextre will move it to a less critical location on the mobile base. Dextre will then head over to Japan's Kibo module to fetch a camera from the module's transfer airlock —a type of sliding drawer that can be depressurized—where the station's crew will place it for Dextre to retrieve. Dextre will install the new camera on Canadarm2's elbow joint, where it will provide critical views of the robotic arm's movements. Dextre is an awesome robotic handyman who totally deserves his own article explaining just how neat he is, but the short version is that he's referred to by the masculine pronoun, he has two arms, with 15 joints granting him a staggering 15 degrees of freedom. And, to the best of my knowledge, he does not have a crush on Curiosity, although I bet they'd be the best of friends. Of course, nothing goes perfectly. Yesterday, Dextre selecting a tool from his holster, and the Canadarm plucked him from the station to dangle in space. Today, he started in on the repairs, but had to take a break when the station moved between satellites and the live feed cut out for just over 45 minutes. After the brief hiccup, the rest of the repair went pretty much perfectly. During operations, the Canadian Space Agency's Twitter feed pointed out just how remarkably flexible the Canadarm and Dextre are, teasing people to try the contortions for themselves. 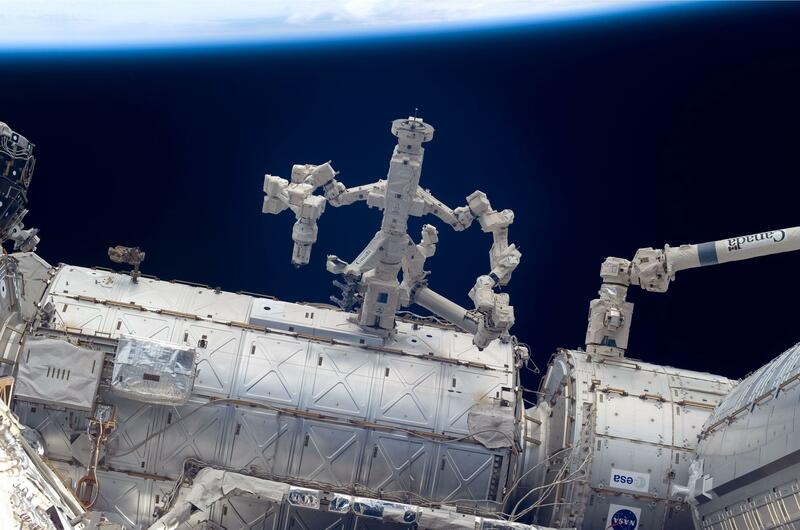 The arm has 7 joints, while Dextre has an additional 15, adding together for astonishing flexibility. Each of those joints can roll or bend, adding in rotational or translational degrees of freedom. The Canadarm bent to position Dextre to scratch its elbow with a wrench. The Mobile Serving System has 11 cameras: two on the Canadarm elbow, one each on the Canadarm boom segment ends, five on Dextre, and one at each mobile base station. Yanking the faulty camera out of position required unbolting it, then a few careful pulls and the inevitable wiggle. The space ballet then continued with the Canadarm doing dips and pirouettes to reposition Dextre to affix the fuzzy-but-functional camera at the mobile base station. The installation of a new camera on the arm was completed the following day. As well as repairing and replacing the valuable cameras used in robotic operations, this is also the first proof-of-concept that repair-robots can service spacecraft while they're still in orbit. While Dextre is an invaluable assistant for astronauts on the space station, maybe one day more robots like it will be sent to repair, refuel, and reposition orbiting satellites. This would drop the cost of constantly replacing older satellites, and reduce the amount of space junk we generate in orbit. We live in a world with self-repairing space robots. It's been a busy month for the robots, too! Earlier, Dextre installed the high-definition video cameras and laser communications equipment that is giving us online access to a constant live feed of our planet from space. Is it too soon to say, "Welcome to the future" again? Update: The repairs were completed the following workday.